Stir the crabmeat and lemon juice in a medium bowl. Stir the cream cheese, mayonnaise, almonds, onions and mustard in a large bowl. Fold in the crabmeat mixture. Sprinkle the flour on the work surface. Unfold 1 pastry sheet on the work surface. Roll the pastry sheet into a 16 x 12-inch rectangle. Place the pastry onto a baking sheet. 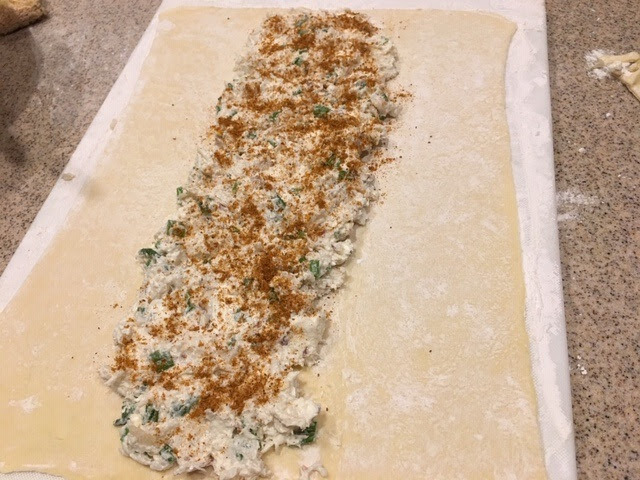 With the short side facing you, spoon half the crab mixture lengthwise down the center of the pastry. Cut strips 2 inches apart from the 2 sides of the pastry to within 1/2 inch of the filling. Starting at one end, fold the pastry strips over the filling, alternating sides, to cover the filling. Repeat with the remaining pastry sheet and crabmeat mixture. Brush the pastries with the egg mixture. Bake for 35 minutes or until the pastries are golden brown. Let the pastries cool on the baking sheet on a wire rack for 30 minutes.